We are blessed at Calvary with an historic church and a beautiful setting. But the real history of a parish is about its people. This brief history tries to say some about both. Travel into the rugged mountains of North Carolina was not easy until 1828, when a turnpike was completed from Charleston to Knoxville. Many people from the Low Country of South Carolina came to the mountains to escape the oppressive summer heat. Some came not only to summer here, but to settle. Such was the case for the founders of Calvary Episcopal Church. Among those settlers was the Blake family. In 1857, Daniel & Helen Craig Blake, proprietors of a stagecoach inn and way station just north of Fletcher, gathered neighbors in their home, spearheading the founding of Calvary Church. They donated the land and led the campaign to erect the first building. Using plans based on drawings of Sir Christopher Wren, a 16th century-style building was planned; clay was dug, kilns built, and bricks were fashioned by hand. The building was completed, beautifully sited on a hill and complete with a bell tower. The Rt. Rev. Thomas Atkinson, bishop of North Carolina, made the long journey from Raleigh for the consecration on 21 August 1859. The founders of Calvary did more than build a building; they set out to found a community. With no public education available in the area, Miss Fanny Blake saw the need for schooling for area children. Donating additional land to Calvary Church, she erected a one-room school house where she taught on both weekdays and Sundays until her death in 1920. Finding a priest to serve the parish always proved difficult, but strong lay leadership conducted worship and bolstered the community. The grove surrounding Calvary Church became a meeting ground for folk of the area. The Civil War brought hardship to the area, but the church endured. The grove was often used as a rallying place for volunteers, and the church building and carriage shed were used from time to time as barracks and hospital as well as for worship. The Old Well was a favored watering place for soldiers from both the North and South. Following the war, the women of the parish raised money for a rectory by holding a weekly market in the carriage shed. With the coming of the Rev. E. A. Osborne in 1877, the parish grew and mission chapels were established. The Word was preached and Sunday School classes were held all over the area, thanks to the zeal of Calvary parishioners. In the early 20th century, the old turnpike became US Highway 25, the main route through the mountains, and growth came quickly. 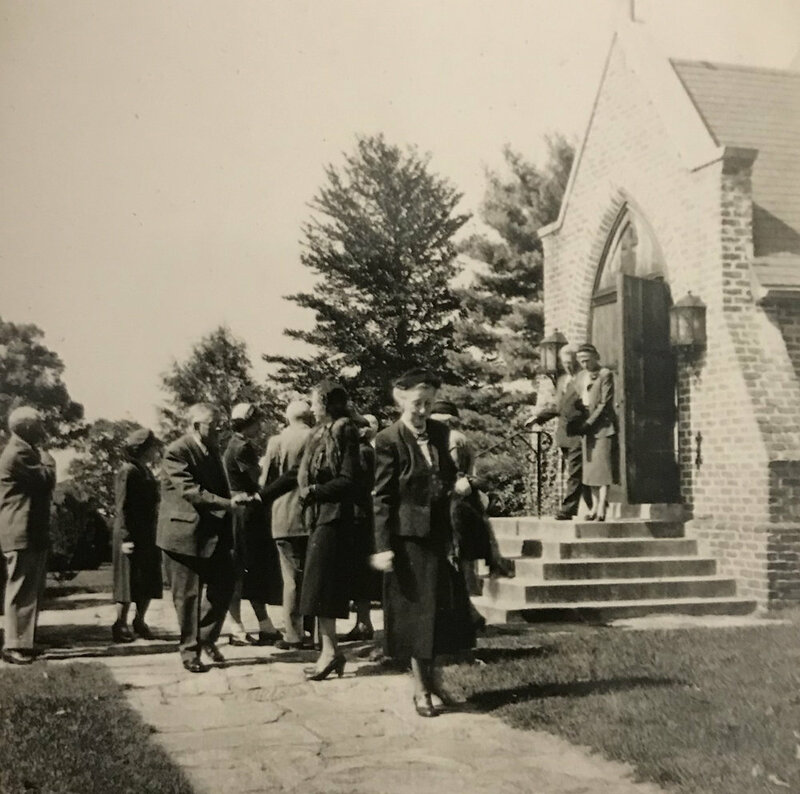 The heights of the roaring ‘20s and the depths of the depression were both keenly felt, but Calvary Church continued as one of the largest and strongest congregations in the newly formed Diocese of Western North Carolina. The original church building burned in 1935, with only the brick shell of the building left standing. One stained glass window, the baptismal font, and a few smaller items were saved. The congregation moved quickly to rebuild; Scottish architect S. Grant Alexander was engaged for the design. The nave was lengthened and widened but the west front of the old building with its beautiful bell tower was saved and incorporated into the new building. The parish grew and flourished with the area. The Rev. G. Mark Jenkins came as rector in 1940, beginning a tenure of 40 years. Parson Jenkins was well known and well loved, ministering to the needs of the entire community. He led the way to the building of a new Parish House – the portion of the facility that houses administrative offices, school rooms and fellowship areas – in 1953. The Parish House then underwent renovation in the early 1980s and, under the leadership of the Rev. David Sailer (rector, 1984-1998), improvements were made in the church: new lighting and a freestanding altar. In 1992, a 2-manual, 23-rank pipe organ by the Holtkamp Company was dedicated after extensive renovations to the chancel and nave. Fr. Sailer oversaw a major renovation and expansion of the Parish House in 1995. Construction was completed in 2000, just as the vestry called the Rev. Victor C. Mansfield as Rector. During Fr. Mansfield’s tenure, the parish explored new ventures in mission work, welcoming numerous community groups into the parish facilities and establishing the Calvary Episcopal Church Food Pantry with the help of other local congregations. Fr. Mansfield retired in 2015, and the Rev. W. Rian Adams served as Rector in 2016 and 2017. The Rev. J. Clarkson was named Priest-in-Charge in February 2018. Even as the surrounding countryside is converted from farmland into houses, stores and apartment complexes, some of the grace and stability of an earlier age can still be found in the structure and spirit of Calvary Church. FLETCHER – There’s a wind that blows between the worlds and riding it are sounds that tease the imagination. It gives voice to the long dead and weaves a picture of events in time out of memory. But to recognize the sounds and the voices you must know what took place on yonder mountain, or along the valley there, or here in the churchyard of Calvary Episcopal parish. For those with an uncommon ear, the wind that whispers in the tall pines that stand like sentinels in the churchyard conjures up scenes of a colorful and eventful period along the old Buncombe Turnpike. So come along to the churchyard of Calvary and wander along the twisting paths beneath the pines in the blue of twilight. Perhaps you will hear the voices of General George Stoneman and his Yankee raiders, for they came this way during the turbulent years of the American Civil War. Listen sharp for the whinny of blown horses, the rattle of mess kits, the mumbling, grumbling of men who wanted to be home. Stoneman’s raiders camped here one night and, as they dismounted, the general was drawn into the sanctuary. Perhaps he went to see what he could plunder, or perhaps his conscience was bothering him and he went to pray. For behind him lay a country he had laid waste, looted and plundered. But he was so impressed with the beauty of the sanctuary and its quiet atmosphere of reverence that he gave orders that no part of the church was to be molested. Next morning, before leaving, his men begged for the church carpet to be used as saddle blankets. The general at last gave in and the raiders were seen going south on the turnpike that day with red church-carpet fluttering from the backs of their horses. Listen and you will hear other voices in the wind, the voices of men who wore Confederate gray and fought for a forlorn cause. For the churchyard was the meeting place of volunteers from the surrounding mountains and valleys to the Confederate Army. The church itself was used at one time as barracks by Confederate troops. There are echoes in the wind, too, of carriages passing down there on the turnpike and turning in the drive. These were the carriages of the people from the South Carolina Low Country who organized the parish more than a hundred years ago, merchants and rice planters of Charleston – summer residents of this region – who, wanting to attend church services of their own faith, had to travel to Flat Rock over the rough miles of the turnpike. Perhaps the voices in the wind that whispers in the pines are the voices of Edmund Molyeaux and Alexander Robertson and Alexander Blake. They were responsible for organizing the parish whose quaint sanctuary has been described as one of the most beautiful country churches in America. At a dinner party at The Meadows plantation one evening early in 1857 the subject of rough roads and the need for a church came up. One of the most enthusiastic advocates for the church was Molyneux, an Englishman who had been serving as a consul for his country to America at the time he began coming to North Carolina. Within a matter of minutes that night more than $500 was subscribed for a building fund and Blake donated four acres for the parish. A Charleston architect was employed to build the church. The bricks for the structure were made here in Fletcher by slave labor. The church was consecrated on August 21, 1859, by the Right Reverend Aktinson, bishop of the diocese of North Carolina. For the first year or so after its completion, the church was kept open only during the summer months and services were held by visiting clergymen. Fire destroyed the original structure in 1935. But the edifice was rebuilt and enlarged less than three years after and was consecrated on the 79th anniversary of the consecration of the original church. Pause there in the churchyard by the grave of Edgar Wilson (Bill) Nye, the famous humorist, and listen to the wind in the pines. Perhaps the wind will send his voice whispering out of time. Yes, there are voices in the wind that plays through the tall pines in the churchyard of Calvary parish. For it is a wind that blows between the worlds and riding it are sounds that tease the imagination. Listen sharp the next time you stand beneath the tall, whispering pines in Calvary churchyard when the blue of twilight is upon the land. 1857 - Mr. And Mrs. Daniel Blake along with twenty dinner guests made a resolution to build a church between the boundaries of Buncombe and Henderson counties. The Blake’s donated four acres of land for the site and helped raise $5,756.26 to erect the modified 16th century Gothic building. 1859 - The church was completed, named and consecrated as Calvary. 1859 - Frances Helen Blake gave an additional thirteen acres to the vestry of Calvary Church. 1870 - The Rev. Thomas Morris became the first resident rector. 1877 - Calvary Mission churches begun; eventually there were eight in all. Some, such as St. Paul’s Edneyville, still exist today. 1929 - Abbey of the South created by the Rev. Stuart McClellan. 1935 - A fire destroyed the original church. 1938 - On August 21 the new and present church was consecrated. The original tower with the bell still hanging was incorporated into the new building. 1940 - The Rev. Mark Jenkins came to Calvary where he served until his retirement in 1972, the longest-serving rector at Calvary. 1952 – The 100- year old original Parish House that also served as a school and a church was disassembled to build a modern Parish Hall for the church. A souvenir book was made as a fund raiser with a wooden block from the original building. 1980 - The expansion of the Parish House was completed and dedicated to Mark Jenkins. 1991 - The Bell Tower, originally built in 1869 was restored. 1992 - A 2 manual, 23 rank pipe organ by the Holtkamp Company was dedicated after extensive renovations in the chancel and nave. 2000 - The Parish House expansion and connector to the church was completed. 2009 - Calvary Episcopal Church Food Pantry was started, and the Most Reverend Katharine Jefferts Schori, Presiding Bishop of the Episcopal Church, preached at Calvary and blessed the opening of the Pantry. 2009 - Calvary celebrated its sesquicentennial. 2018 – The pipe organ was disassembled and sent to Ohio for its first major renovation since installation.